Please take a moment to read our rules and make all members of your party aware of them. Sunfox Campground and all of our guests thank you and your family in advance for your cooperation. Be considerate of other campers. Do not do such things as cut through other campsites, keep an untidy site, or act discourteously towards other campers. Please be aware of published check-in and check-out times. Sunfox reserves the right to evict without refund any person or persons who, in our judgment, are creating a disturbance or participating in or causing undesirable influence or behavior. Sunfox is not responsible for injuries, accidents, fire, theft, or loss of valuables. PETS: Sunfox welcomes you to bring your dog camping, and you may walk your leashed dog on all roadways and around the perimeter of the pond (excluding beach and dock areas), and owners are responsible for cleaning up after their dog, both on your campsite and when walking your dog. Pets are not permitted in any buildings, on the beach or on any recreational areas such as playgrounds or ball fields. All dogs must be of a friendly disposition, and any specific pet determined by the management to be a danger, hazard or nuisance will be asked to leave. Any pet left unattended on site and causing a disturbance may be removed by the dog warden, with any fees being charged to the pet owner. Well behaved dogs are invited to swim in the pond on the opposite side (beyond the bridge & across from the beach area), but please do not disturb waterfowl or those fishing. While we also permit dogs in our Rental Trailers on sites 5, 7 and 66, we discourage dogs from Site 7 due to the attached screen room that would be vulnerable to a dog’s nails. BIKES: Bicycles and scooters must be ridden in a safe and responsible manner. This includes returning all bikes/scooters to your site by dusk—no bike riding after dark. Any bike/scooter left out after dark will be locked up overnight for the safety of the rider. The use of helmets is required for all cyclists under the age of 16. Please use bike racks when possible. Sunfox reserves the right to impound any bike that is being ridden in an unsafe manner (including riding after dark) for the remainder of the camper’s stay. Skateboards are prohibited entirely, and roller blades may not be used in any area in which bikes are prohibited. See “Vehicles” for permitted uses of electric scooters for adults. QUIET HOURS & CURFEW: Unreasonably loud noise levels or profane language will not be tolerated at any time. Quiet hours are observed from 11:00 p.m. to 8:00 a.m. Portable audio equipment is to be used on campsites only and at an unobjectionable volume. No fireworks of any type are permitted, including “sparklers.” All children and persons under age 21 must return to their sites by 11PM. During quiet hours, please realize sound travels easily. We reserve the right to end any gathering that, in our judgment, disturbs quiet hours. Any campers arriving after the start of quiet hour may be directed to an overflow area until morning to prevent any late set-up from disturbing those around you. Our after hours emergency security phone # is (860) 705-2629. VISITORS: All guest vehicles must park in the visitor parking area and display current guest pass. Day visitors must leave by 10:00 p.m. Visitors remaining after this time will be charged the overnight visitor fee in addition to any guest fees already paid. Campers are responsible for the behavior of their guests. An adult presence (21 & over) at campsite is required for any guests to be present. Children and teenagers may not be left within the campground without an adult present. Please review our visitor and extra guest policy. VEHICLES: All vehicles must display current pass from rear view mirror. Vehicles must be parked on site or in visitor parking (across the bridge and to the right, just beyond the jumping pillow). Cars are not to be used for in-park transportation (such as going to the beach). Drivers should exercise caution when entering and exiting the campground, recognizing our Speed Limit of 8 MPH. Pedestrians & cyclists should stay to the side of the roads and not impede vehicular traffic. Other motorized vehicles (motorcycles and mopeds) may be used when entering and exiting the campground only, and motorcycles should not be used during quiet hours. The use of ATVs or gas scooters within the campground is prohibited. Electric scooters may be used responsibly by adults 21 & over only, kept at 8 MPH or less and with no passengers. There is no washing of cars, and the use of power-washers is strongly discouraged on weekends. NO SMOKING AREAS: There is no smoking in any of the buildings at Sunfox. This includes the restrooms, laundry, and rec hall. There is also no smoking within the pool area, on the beach or playground. Smoking is prohibited within the “playing area” of all scheduled activities. Per CT State Law, no smoking by anyone under age 18. TRASH & RECYCLING: Campers are asked to bring their trash & recyclables to one of the receptacles located near the dump station at the entrance. Single stream recycling means you do not need to separate your plastics, paper, metals and other recyclables), as that can all go into the recycling receptacle (either loosely or in a clear bag–no black bags into the recycling containers please). No bulky waste, such as old TVs, mattresses or tires. Please do not leave trash out at night, as it will attract critters here in the country, including, but not limited to skunks, raccoons, opossums, and the elusive sunfox. BEACH: Parents must exercise supervision over their children at the beach. There is no lifeguard on duty. Children under age 13 must be accompanied by an adult. No persons incontinent or children in diapers are permitted in the pond. Disposable swim pants (such as “Little Swimmers” by Huggies) are permitted for toddlers, and strongly suggested. No swimming after dark. Pets are not permitted in the beach or dock area, but are invited to swim in the pond on the opposite side (beyond the bridge & across from the beach area), but please do not disturb waterfowl or those fishing. Paddleboats may be rented from the office, and life jackets are provided (and required for all children). Turbochute waterslide requires the use of the inflatable sleds, available for rent from the office, and parental supervision. SWIMMING POOL & ADULT HOT TUB RULES: The state of Connecticut requires the following rules to be posted at the pool: All persons shall bathe with warm water and soap before entering the pool (tokens for showers available at pool during pool hours). Any persons known or suspected of having a communicable disease shall not use the pool. Spitting or blowing the nose in the pool is prohibited. Running, boisterous or rough play (except supervised water sports) is prohibited. Emergency phone is located on pool shed wall within hot tub area, and first aid kit is available at office. In addition, the state requires the following rules to be posted at the adult hot tub: Elderly persons and those suffering from heart disease, diabetes, high or low blood pressure should not enter the spa.Do not use while under the influence of alcohol, anticoagulants, antihistamines, vasoconstrictors, vasodilators, stimulants, hypnotics, narcotics or tranquilizers. Do not use alone. Observe a reasonable time limit, (preferably not longer than 15 minutes) then shower, cool down and, if you wish, return for another brief stay. Long exposures may result in nausea, dizziness or fainting. Pregnant women should consult their physician prior to use. Oils, Body Lotions and Soaps. Oils, body lotions and soaps shall be completely removed by the bather prior to use of public spas. ADA accessible lift available for use. 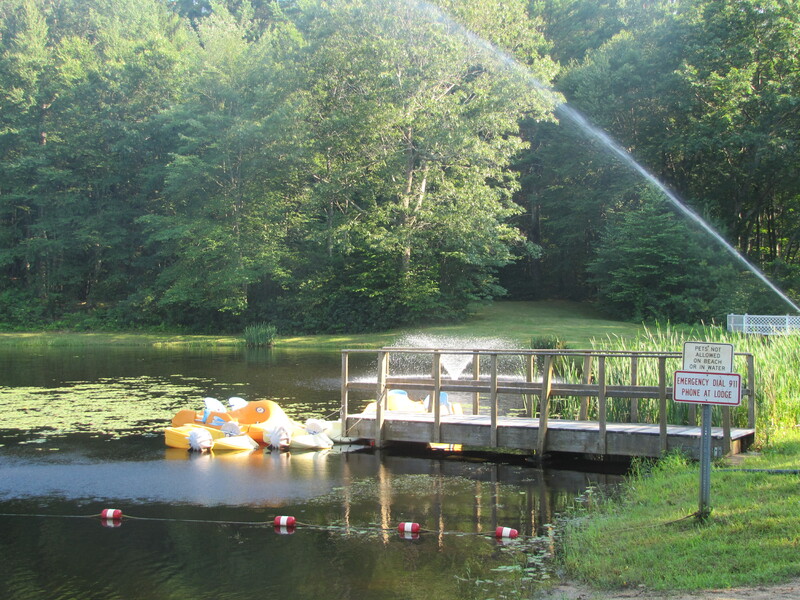 SITE RULES: The campground is on a public water supply that can produce water pressure in excess of 80 psi, so a pressure regulator is encouraged. Due to the threat of invasive species such as the Asian Longhorned Beetle, in accordance with the CT DEEP, no outside firewood may be brought into Sunfox (local firewood only). All campfires must remain within the fire ring at a reasonable level. All fire rings must be left in place (improper placement could cause melting of underground cable TV wires). Do not tamper with stone walls for any reason. Do not cut, deface, or anchor anything to any trees or shrubs. This includes hammocks, tarps and clotheslines. Only trailer-mounted clotheslines are permitted. In accordance with state law, there shall be no discharge of gray water, except into an an approved and installed dry well drain, and may not be run onto the ground. If not released into a dry well, you may drain into a bucket and empty the dish & shower water at the dump station. Sewer hose (3″) may be run into campground sewer connections only and may not be used to discharge gray water into a dry well. Any discharge of graywater (sink & shower) MUST be through s standard 3/4″ garden hose, and can’t be released through a larger septic hose, as this prevents accidents. A $25 fee will be applied if graywater drain becomes clogged with cooking waste or fats. Please do not use large sections of carpet or artificial turf on grassy areas. Absolutely no “house type” refrigerators are permitted. Any small (max. of 4 cubic ft), portable, locked refrigerators are subject to an electrical surcharge of $2.00 per night. Any approved site work that creates objectionable noise (power tools, leaf blowers etc) is prohibited on weekends between Memorial Day and Labor Day. OTHER NOTES: Due to insurance constraints, the use of skateboards is prohibited. No firearms of any kind are permitted, including BB guns or paintball guns. For safety reasons, motorized toddler vehicles may not be used off your site. “For Sale” signs are permitted to be displayed from any inside window of your RV, but exterior “For Sale” signs (similar to real estate signs) are prohibited. Open display of alcoholic beverages is not allowed. Glass bottles, keg beer and drinking game behaviors are prohibited entirely. Please note Check-in and Check-out times.